This interesting design won the annual D&AD Student Awards and the concept handset belongs to Chi Shing Lo, one of the talented students at the De Montfort University. The “Hole” phone features (predictably enough) a hole, that can be used for charging purposes (inductive), as a data transfer port and last but not least as a camera view finder. The above-mentioned hole is surrounded by a mirrored surface, so it’ll allow the user to take his/her own picture, for the usual narcissistic fun. Hmmm, how about using that hole as magnifying glass with the aid of a lens or as a wrench if your imagination is wild enough. 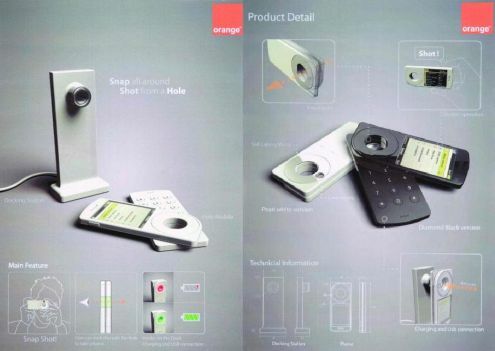 Oh and by the way, the handset was designed for Orange so that’s a semi-promise that it’ll become real one day.